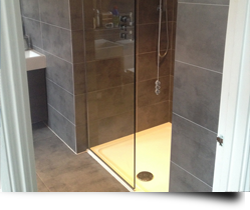 Glass splashbacks, shower cubicles, enclosures and glass wall panelling will not only transform your bathroom beyond recognition, but also create a feeling of almost unlimited space in the smallest of areas. Glass splashbacks are a modern, hygienic alternative to ceramic tiling, coloured glass splashbacks are becoming an increasingly popular choice in bathroom design. Splashbacks of Distinction offer glass that is clear, coloured or frosted. Colour matching is easy. Whatever colour or texture you want, please contact us and we will be happy to help. Glass splashbacks and wall panels are truly bespoke products with a thickness of 6mm or 8mm, and can be fabricated to suit individual design requirements.